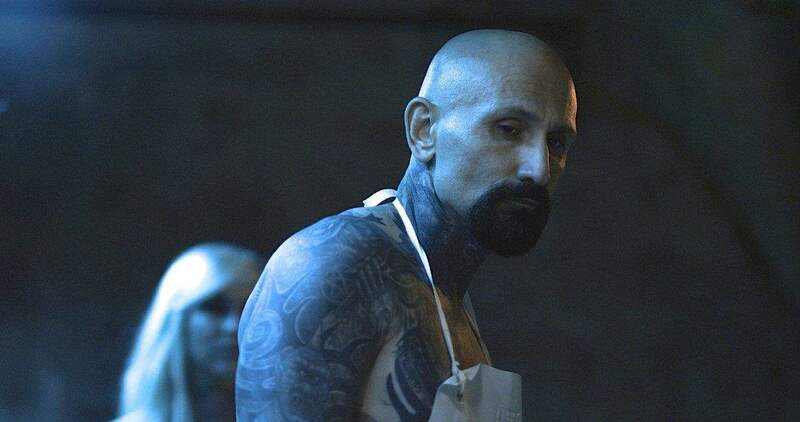 Wicked Horror managing editor Tyler Doupe´recently had the occasion to speak with veteran character actor Robert LaSardo (who also stars in Human Centipede III) about Anarchy Parlor, his latest foray into horror cinema. We got the lowdown from Robert LaSardo on his creative process, talked with him about how he is able to communicate a great deal while saying very little, and chatted extensively about his impressive collection of body art. Anarchy Parlor tells the story of a group of teenage friends that travel to Lithuania. While there, they visit a mysterious tattoo parlor run by a mysterious man known solely as ‘The Artist’ (Robert LaSardo) who practices an ancient and extremely brutal technique passed down from generation to generation. As the teens begin being picked off at the hands of The Artist, we gain more insight into his motivations and his profound desire to create beautiful art. Wicked Horror: The Artist Seems like a role that was written for you. I can’t think of many other people that could pull it off as effectively as you did. Was the part written with you in mind or were you cast after the fact? Robert LaSardo: I was cast after many conversations with Kenny Gage and Devon Downs. We recognized a common frustration as artists in general. Sometimes writers and directors confine within a particular type of communication within the realm of entertainment. You can get locked up within a specific mythology without a lot of dexterity or room to grow. After those conversations and listening, not just to my feelings, but listening to Kenny and Devon speak about some of the ideas they had and how they perceived themselves and what they saw happening in Hollywood and entertainment and some things they were disappointed about and frustrated over. And listening to them speak, I was affected by that as well because I thought that maybe I was the only one that was noticing a shift in entertainment that was more focusing on the superficial aspect of films and not really developing characters in a way that made sense to us. I’m not saying that it was wrong, it just didn’t seem to be like there were a lot of archetypes within storytelling that made sense to me, that I could relate to. One of the reasons I think I was so effected by movies over the years is that there is usually a mythos or an ideology present in the writing or within the character’s framework that I could relate to. And I found less and less of that when I would see movies in the present day. As we talked and they had a better sense of me as a human being that it was an inspiration to write a character called The Artist. The answer is yes. There’s a piece of me in The Artist in terms of the aspect of creativity that needs to be present in the realm of play. After a while, if you don’t grow as an artist or a performer and you are not allowed to grow and to take on different types of projects and sound your instrument so to speak–yourself–you don’t grow and you face extinction. You also get bored by the same repetition or similar manifestation. So, I think that Kenny and Devon recognized certain qualities within me, I guess, and stuff I had learned in theater–stuff that my acting teachers helped conjure–that was not being allowed to grow, allowed to manifest in mainstream entertainment. I think that combined with them being able to realize that, like myself, they were not alone in their thinking and that they could talk to me and I was open to all kinds of possibilities. I think that’s the genesis of Anarchy Parlor, the anarchy being not a T-shirt or some trend or some nonsense–the anarchy being real in that we are the resistance. We are resisting the dictates of the system that says, ‘No, this is the story you need to tell. This is what’s acceptable. This is not acceptable.’ And we didn’t agree with that. Anarchy is appropriately placed in front of the parlor, the tattoo parlor, which is also a platform of creativity where artists draw pictures. So, I think the two together are a perfect marriage so that we could break new ground and feel liberated. Like I said, if you don’t grow and evolve, you can feel stifled of the creative spirit within yourself and you don’t want that to happen, so you have to kind of break the rules, so to speak, and be defiant. The stories that you tell also kind of have to be extreme to get the attention of the audiences that have been lulled into sedation by mediocrity. So, that element is present within Anarchy Parlor. I think, also, the very nature of my being can be extreme in terms of the way that I embrace the art form. I think that Kenny and Devon saw that because that’s a vitality that’s unusual in the realm of show business. They’re talented men. They are creative but they are also very vital. And I think that’s kind of a rare combination an integration you don’t often see. Wicked Horror: You play the villain or the antihero in Anarchy Parlor and have played a bad guy in many of your onscreen appearances. Would you say that you are drawn to those roles or that those are the kinds of roles that casting directors seek you out for? Or is it maybe a combination of both? Wicked Horror: The thing that really stands out to me is the way that you take a script and look at how you can improve upon it or bring more depth to the character. I think that’s really insightful and really impressive. I know there are a lot of actors that don’t put that much thought into it. They take what’s on the page and bring it to life as what’s written. It’s great to hear how much thought you put into your performances. Robert LaSardo: Thank you. I’m glad that communicates. In terms of time, the issue being how much time one is given to perform has always been irksome to me, meaning that when people observe a performance, what I’ve noticed is there is an evaluation that occurs, which is how much time were you given to perform? My response to that is always, ‘It’s not how much time you are given, it’s what you do with it that makes an impact.’ I think that when you talk to most people and they try to reference a film, they don’t always remember the name. They don’t remember every detail about the film but what they will be able to recall are moments in that film that affected them, that made an impact. So, that’s what I was taught by teachers. It’s not about the size of the thing or what it looks like. It’s about what you do with the time. So, I would say to anybody that’s listening or reads the interview, please don’t be dismayed by the amount of work they offer you. Be grateful and take the time to recognize it’s what you do with the time that matters, not how much time they give you. Wicked Horror: That’s really great advice. I’m shifting gears a little here. In Every role I’ve ever seen you play, you are a man of few words. Yet the audience always seems to know exactly how your character is feeling. How have you been able to master the art of communicating nonverbally? Robert LaSardo: Let me give an example: You know when you are in a social situation and you’re in the presence of others. Maybe the person doesn’t know the people [around them] very well and there are few words spoken because of the awkwardness in social situations. But you feel the vibe. And we’re all thinking and feeling. Thoughts are arising. Thoughts effect our disposition. And that’s a very real aspect of the human condition, isn’t it? So, I don’t have to say something when I walk into a room to effect the people sitting in that room. My disposition and the thoughts I think, in relationship to that situation, what I bring with me in terms of my life history, what happened a few moments before I entered that room. All those things are relevant and I think that vibe is maybe what people are picking up on through the lens of what they observe in film. Wicked Horror: I don’t think that’s necessarily an easy thing to do in film. So, that’s what is really impressive to me about your performances. You can communicate in a few words what might take another performer a whole paragraph to get across. Robert LaSardo: Tyler, it also comes from feeling locked up in day to day life, where so much of what we say or do is being either judged or censored. So, when they say action, I feel that I’m allowed, finally, to release myself, whether it’s within the words or without words, I can embrace the circumstance fully. And I’m asked by the director to be sort of a conduit within the framework and so I’m not being censored. I’m not being limited. I’m actually being asked to be honest, I guess, in the way that I look at those around me, how they effect me and then respond, whether it’s with a look, or saying something without words; how I look at a particular object within the scenery, how it effects me, all of these things. While I’m experiencing that moment-to-moment reality and thinking real thoughts, it is something that I guess, from what you described, is something that is appreciated. I feel like so much of that in day-to-day life is just ignored. How we react to an environment, a setting, an individual, whatever it is. And then pause in that moment and look and take a deep breath and exhale a word or two that has a whole gamut of feelings. It’s almost something that you’re prevented from doing. [People say] ‘You feel too much, Rob.’ You think too much, Rob’ ‘Don’t think so much, don’t feel so much. Just minimize your moment-to-moment experience. Play a game. Be fake. Hide behind an image, a facade.’ So, when they say action, I don’t feel like I even wear a mask in my day-to-day life but I have to minimize myself because not everyone understands what I’m saying, so I feel like that’s almost the truest aspect of my reality, as opposed to the day-to-day life where we’re all kind of pretending to embody our tasks and our personal dispositions and present them to the world because that’s what we’ve been told to do. We have to behave a certain way or else we’re crazy. Wicked Horror: That’s so ironic that you would feel like your on camera persona is almost more authentic than off camera. That’s fascinating. So, your tattoos are almost like your trademark. I’m curious if you have one artist in particular that you always work with or if it’s been a variety of people over the years? Robert LaSardo: I’ve been fortunate to come across a young man who’s extremely talented. He’s been able to integrate a variety of images that I’ve collected over the years and create a cohesive structure. Steven Hullander at Paragon Tattoo at is a great tattoo artist and he’s been extremely proactive regarding the film Anarchy Parlor, making flash sheets for the film comprised of images from the movie. And I think that’s really just beautiful. I am fortunate to have someone that I trust that’s an amazing artist. At least for me, tattooing is such a personal experience. Someone sticks a needle into your skin, it’s not just the needle going in there, it’s their energy. I think you want to sit across from someone that understands you spiritually and understands you as a person. So, yes. I think I’m fortunate enough to have found someone that I consider not just a tattoo artist but a friend. I don’t know if I’ve ever had an experience like that. I’m not saying that the tattoo artists that I’ve met over the years haven’t been good men. But they were performing a service and I’m there to receive that and I’m grateful to develop a friendship within the framework of that, which is not always easy to do. So, I guess I do have someone finally after all these years that I can say is a friend and an artist and understands me and I trust. Wicked Horror: Speaking of your tattoos, I’m curious if you have ever been asked to cover them for a part and if so, did you turn it down on that basis? Robert LaSardo: In the 1990s, I appeared on NYPD Blue. It was Steven Bochco’s first season. He also enjoyed tremendous visibility with that show. I think there was some concern about characters with tattoos on the neck because the character they had me read for and eventually hired me for was involved with an armed robbery–tattoos on the hand and arms were ok–but tattoos on the neck made the character too easily identifiable in a lineup. So, they asked me if it would be ok to do a test to see if they could cover the tatts on the neck so it would be believable. That was one instance where they used makeup to cover the neck tattoos because I don’t think anyone would have been able to believe that I would be able to slip the whip of justice so easily with such visible marks on my neck. I think that was the only time. But when I go through customs, I think I cover up a bit because some of the men with the badges aren’t always as diplomatic as they’ve been taught to be. So, I think more in my real life, I make it a point to try to cover up as much as I can depending on the situation. Wicked Horror: Speaking of that, you began getting tattooed before it was really considered to be somewhat culturally acceptable. And like you just said, there are some people who still consider it taboo. But I’m curious if you ever expected it would become as socially acceptable as it has in the past fifteen years or so? Robert LaSardo: No. I look around me on a daily basis and I’m fascinated by what I see, in a good way. So, the answer is no. I never would have imagined. I never really considered the future when I was exploring that time in my life and communicating myself with ink. I just knew that I was compelled to express myself that way. But aside from that, if anyone would have told me that young women and men would be collecting artwork to the degree that they’re collecting and that it has been embraced or somewhat exploited in the mainstream to the degree it’s been, I would have never imagined that. I would have never thought, in my wildest dreams that would be possible. Wicked Horror: Thanks so much for speaking with us! The Brood is Cronenberg’s Most Autobiographical Movie: Here’s Why!